Security researchers have discovered a way to replicate a person's eye to bypass iris-scanning security systems. A team at the Universidad Autonoma de Madrid was able to recreate the image of an iris from digital codes of real irises stored in security databases. The findings were shared at the annual Black Hat security conference in Las Vegas. It raises doubts over what is considered to be one of the most secure methods of biometric security. Researcher Javier Galbally and his team, which included researchers from West Virginia University, were able to print out synthetic images of irises. In one experiment, the researchers tested their fake irises against a leading commercial-recognition system. In 80% of attempts, they said, the scanner believed it was a real eye. While researchers have been able to create realistic iris images for some time, it is thought that this is the first instance where the fake image can be generated from the iris code of a real person - a method which could be used to steal someone's identity. 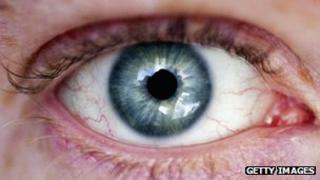 An iris code is the data stored by recognition systems when it scans a person's eye. It contains around 5,000 different pieces of information. The research was explained to an audience at the annual Black Hat conference, a meeting of the leading figures in IT security from across the world. Shawn Henry, the former head of the FBI's cybercrime unit, gave a key speech at the event. He urged security experts to counter-attack in their attempts to stamp out criminal activity. "We need warriors to fight our enemies, particularly in the cyber world right now," he told his audience. "I believe the threat from computer network attack is the most significant threat we face as a civilised world, other than a weapon of mass destruction." He called on the computer security industry to begin looking at ways of gathering intelligence on possible attacks and attackers, rather than seeking simply to block them when they happen. "It is not enough to watch the perimeter," Mr Henry said. "We have to be constantly hunting, looking for tripwires. "Intelligence is the key to all of this. If we understand who the adversary is, we can take specific actions." For the first time, Apple representatives will be speaking at the Black Hat event. The company is expected to outline security features in the coming release of its latest mobile operating system, iOS. The appearance comes at a crucial time for Apple. Earlier in the year, the company's Mac range suffered a malware attack, with more than 500,000 machines infected. The fallout put a dent in Apple's reputation for producing computers that were safe from the kind of attacks which are common on PCs. According to Black Hat's general manager Trey Ford, Apple was scheduled to appear at the event in 2008, but pulled out after the company's marketing team intervened. "Bottom line - no-one at Apple speaks without marketing approval," Mr Ford wrote in an email quoted by Bloomberg . "Apple will be at Black Hat 2012, and marketing is on board."